There is not much difference in celebrating the Passover between Orthodox and other Christians. Basically that difference is not a principled thing. Orthodox, Catholic, and Protestant Christians alike believe in the resurrection of Jesus Christ. 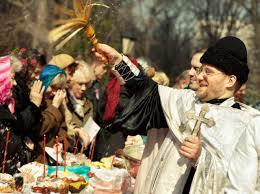 There are some fact about Orthodox Easter Day in Russia. Jesus fasted 40 days before beginning His ministry. Therefore, the pre-Easter period is also symbolized as fasting 40 days before the victory of Christ in resisting the temptations of the devil. Fasting starts from Wednesday, 46 days before Easter. This is because there are 6 days do not perform fasting. That is on Sunday. Ash Wednesday is the day when orthodox Christians start fasting with incised ashes on the forehead. On this day also humans remember that their origin from dust. The Eastern Orthodox Church requires women to cover their heads with a veil, just like a Muslim woman, while in church. This practice occurs in the Russian Orthodox Church. In addition, when to church, women are forbidden to wear trousers. Women should wear long skirts. For the Orthodox, Easter is a very emotional celebration. After a week-long worship service and strict fasting, at night after the procession and chant the prayer chant, the priest stopped in front of the closed temple door. The pastor will then open the door and will symbolically open the door of the holy tomb and announce to all that Christ has risen. Throughout the Passover mass, the pastor and congregation will exclaim: “Christ has risen! He is indeed risen!” This moment is very impressive. These cheers broke through the silence of the night and resonated into the still-leaved houses and trees. During the reign of the Russian Tsar, celebrating Easter was much more complicated than Christmas. Easter bread and other special foods are served. Ornamental eggs are given as gifts. In addition, Russia also has a special game to celebrate Easter which is also owned by other European countries. The game of rolling eggs appeared in the XIX century. It has long been a tradition in Russia and Germany. The game tradition of rolling eggs is also adopted by the US. The White House annually holds a game of rolling eggs in its yard. In Russia, now many stores are back selling special skates to topple eggs. The rule of this game is that you are required to compete quickly overthrown eggs to touch the prizes available at the end of the lane. The game ‘egg duel’ held, where you can attack other eggs, to see whose eggs are cracked. The housewives will also race to decorate the eggs as beautifully as possible. Then present them to their relatives and friends. How can rabbits become element in easter day? The tradition of Easter eggs is often associated with the Easter Rabbit. The Easter Rabbit is a traditional symbol in the Passover celebration. Its role for judge whether a child is good or mischievous (like Santa Claus). Rabbits will bring an Easter egg to good children the night before Easter arrives. Rabbits are also a symbol of fertility. This is because the birds lay eggs early in the spring, as well as the rabbits that breed with large numbers in the spring. Rabbits have a very fast reproductive cycle. So it is can symbolize with the meaning of fertility. In the West, rabbits and eggs become a popular symbol on Easter celebrations. In Russia you will find colored eggs and kulich (pasche cake). This Easter cake is very popular in Europe. There are many recipes of Italian pastry cakes sold in Russia. Another unique tradition in Russia is to make paskha (Russian for Easter). It is a dish made of cottage cheese with raisins. The shape of cakes is like a pyramid as a symbol of the sacred tomb.